It is unclear when a decision will be handed down in the case brought by a group of Seafield, West Coast Berbice rice farmers, who have challenged the revocation of their land leases by President David Granger. Philip Alexander Johnson, Rupert Blackman, Rawle Miller and Doreen Monah had visited Stabroek News over the weekend to issue an appeal for the court to deliver the awaited ruling. Acting Chancellor Yonette Cummings-Edwards, who heard arguments in the case, is yet to deliver her ruling, some six months after final arguments were submitted. 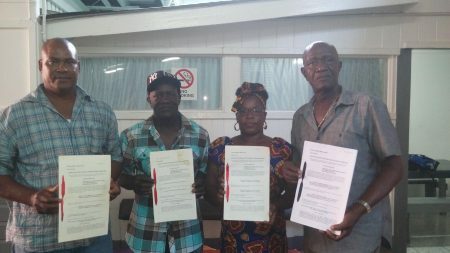 Revoked leases: Rice farmers (from left) Rawle Miller, Rupert Blackman, Doreen Monah and Philip Alexander Johnson holding up their leases last week. Neither of the offices could say when the decision is likely to be delivered. Meanwhile, the farmers have said that the prolonged delay has put their lives on hold, making it extremely difficult for them to adequately care for themselves and their families. In April last year, the quartet was forced to return to the court to challenge the revocation by President Granger. They had earlier won a legal battle against the Mahaica, Mahaicony, Abary-Agricultural Development Authority (MMA-ADA), which had illegally cancelled their leases for farmlands at Seafield. Johnson had related that they were informed of a date for a decision but when they turned up at court they were told that the Attorney General had asked for more time to include additional arguments. According to Johnson, in April this year, the court was in possession of the arguments from all the parties involved. He said that no date was given but it was clear that the all arguments were given and therefore all that is left is the decision from Justice Cummings-Edwards. Johnson pointed out that another judge has already given a decision in a similar case, though it was filed after his. He was making reference to a constitutional motion filed in May this year by Joylyn Nicholson and her sons, Gratien Nicholson, Vaughn Aaron and Herman Nicholson fellow villager Brian George and his daughter, Tiffany Hubbard. They were issued 50-year leases in 2014 by former president Donald Ramotar. Acting Chief Justice Roxane George SC in August ruled that President Granger’s cancellation of their leases was unconstitutional, given in part that those agreements were valid and binding. “That case come and deh and we still deh hey waiting,” Johnson stressed. “We are poor people, so we are depending on the court’s decision so that we can reap again someday,” he added. The farmers said that they were able to get one crop from the land prior to the revocation and were preparing to reap the second crop when they were violently chased off the land, which was later rented out to persons outside of the village. They all expressed the hope that this matter will soon be determined so that they can move on with their lives.